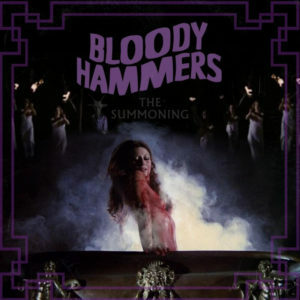 Home > NEWS > BLOODY HAMMERS – New Album To Be Released This Summer! Is it Halloween yet? Silly question, it’s Halloween all year round for BLOODY HAMMERS! As special gift and horrific surprise they deliver their fifth studio album entitled The Summoning on June 26th 2019 via Napalm Records! Halloween comes earlier this year! The U.S. duo has prepared a wonderfully creepy horror musical experience that pays homage to classic flicks such as “Let Sleeping Corpses Lie” (1974) and “Now The Screaming Starts” (1973). BLOODY HAMMERS’ idea of a soundtrack for your favorite video nasties holds some surprises on their upcoming record. “When I think about my earliest influences, the horror film genre is just as important as musical influences and they’re all fuzed together in my brain from childhood. When I was a kid, there was a show called ‘Shock Theatre’ that aired late at night on our local WGHP network in the early 80s. They played ‘Dr. Phibes Rises Again’, ‘Children Shouldn’t Play With Dead Things’ and weirdness like that. Around the same time slot, over on channel 61, there was a music video show that played Ozzy, Iron Maiden, Alice Cooper and all those artists our satanic panicked local churches and teachers were freaking out about… and forbidding.